I am coordinating an auction of decorated surfboards to take place in September raising funds for the Cancer Council through Relay for Life. I collected used surfboards and then put out a call for artists to decorate them using whatever medium they choose. Myself and 10 artists are working on surfboards to be auctioned and I have just finished mine as pictured below. I reworked a large wall hanging made previously and cut it to shape around the surfboard. 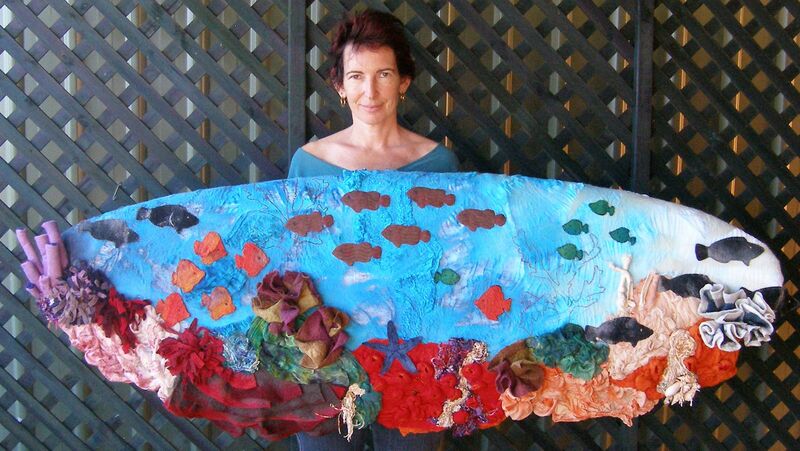 The background is muslin which I partially felted, dyed and hand stitched the outlines of some coral onto. The remaining coral I made using oddments of felting experiments such as ruffle edged scarves, pieces I had felted around pebbles as experiments and so on. I also used oddments of dyed fabrics and lace I had made so was able to create the piece using a lot of bits from my experiments box. Hand stitching was added in various places along with some beads and shells. I was pleased to be able to construct this through recycling experimental work rather than using new materials.